Planning an adventure can feel overwhelming when you have other people to consider, and all the more so when that “people” is a tiny person, Travel and Tourism expert, Kate Gibbs writes. As a new parent, I’m determined not to allow a brand new little man in my life cancel out my love of adventure via packing my bags, travelling in style and taking a break from the daily grind. I may have to put the trip to the Himalayas on hold for a few years, but a baby opens up destinations I’ve not previously seriously considered. With a little planning and almost no compromise, it’s possible to find a perfect escape with a baby in tow. A savvy mother of three under five recently told me she draws a radius of two hours around her home in Sydney and only makes trips with her trio of tots within that area. Be it two hours by plane or 90 minutes by car, the door-to-door scenario has fit neatly within that time frame. It sounds constraining, but this discerning traveller says the apparent pitfall of parenting has opened up a new world that’s relatively close to home. Instead of dreaming up distant tropical climates, search more carefully for local destinations you’ve been saving for later or “one day maybe”. That day has arrived. 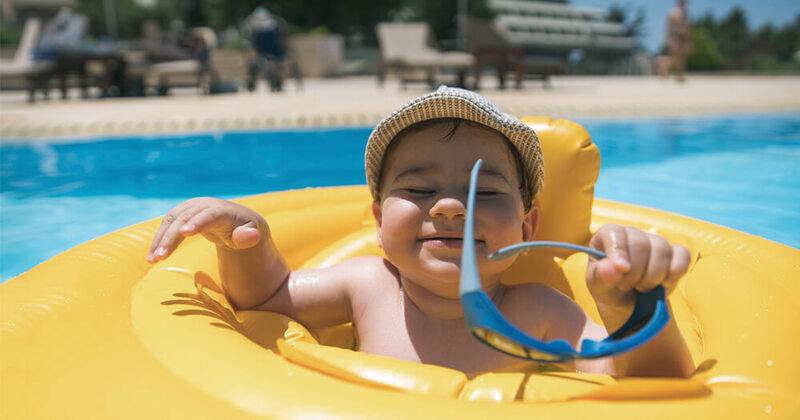 Balancing luxury travel for parents and family friendly for babies or children is not an easy challenge, but many resorts are rising to the challenge by offering quality in-house restaurants, nannying services, as well as child-safe activities. In Australia, most four to five-star beach resorts will supply buckets and spades for sand digging, sunscreen for bub, and floating devices to be used with scrupulous parent supervision. At the other end of the spectrum, camping may not offer the same services, but what baby misses in bouncing chairs and play mats, she will find in nature’s fallen leaves, filtered light and being carried on short bush walks in a baby wrap on mum and dad. Do plenty of research online and call resorts before you book. If you need a cot, a microwave for bottle sanitation and a bath, then make sure your accommodation has them before you pack baby and the kitchen sink into the car. But keep it simple, as well. You can pack smartly and not worry about having access to every baby trinket and contraption in the world. Remember, baby will be happy with a spoon, a pot and your smiling face. The potential gadgets and gizmos you can buy are endless, but I truly believe the one thing your baby needs in the first year of life is your time. If you happen to be also sitting under a palm tree drinking a coconut, surely baby won’t mind joining you. Travelling with a baby is more difficult, to be sure, but nothing is impossible. You can still spend weekends away, travel overseas, take road trips and go camping. There will be things you need to tweak, and it takes more planning, but parents travel all the time with children and not only survive but actually have fun. Are you thinking about easing yourself back into your career after parental leave? Read our simple guide you can follow to help you smoothly make your transition back to work, here.